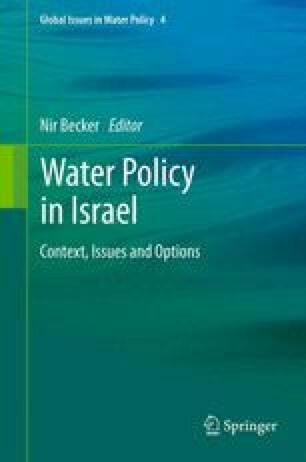 This book aims to focus on the policy of the water sector in Israel. It brings together 16 chapters written by experts in their field. Each chapter deals with a different aspect of the policy dimension. In this introduction chapter, I draw the linkage among them besides providing the justification for this book and describing the water sector in Israel in a concise way. Bain Committee. (2010). National Committee report on the management of the water sector in Israel. A special report submitted to the Israeli parliament (Knesset). Jerusalm, Israel. http://elyon1.court.gov.il/heb/mayim/Hodaot/00407510.pdf. Magen Committee. (2002). A special report of the Israeli Parliament on the water sector. The Knesset, Jerusalem, Israel. http://www.knesset.gov.il/committees/heb/docs/vaadat_chakira_mayim.htm.